When it comes to breakfast food, I would honestly rather eat leftovers from dinner the night before. There are some things I like now and then - Belgian waffles, biscuits and ham, quiche, and of course anything remotely resembling crumb topping, cinnamon rolls, croissants, or sourdough toast - but I am easily uninspired by the classics. I mean, say what you will, a smoothie is still a smoothie. French toast is still bread sogged in egg, cooked to a strange texture. Yogurt will be yogurt end without end, amen. It's so hard to get me excited about breakfast which is why, if we go out to brunch, you can usually find me burying pancakes or waffles under a copious measure of whipped cream. I'm pretty much just in it for the fruit and whip. 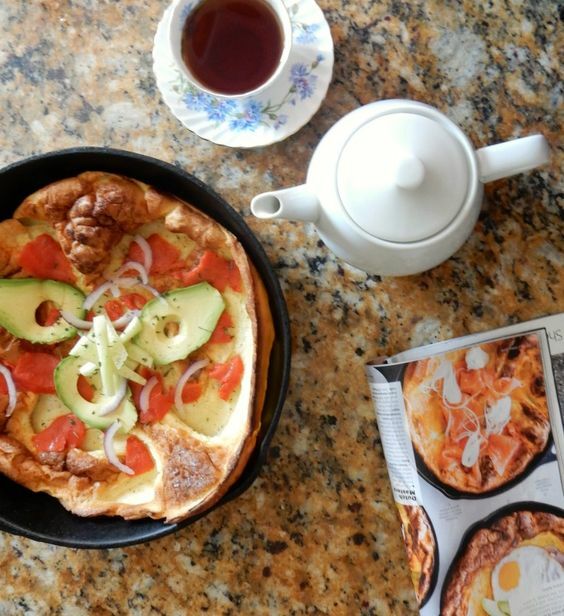 So when I saw a page in Bon Appetit Magazine highlighting savory dutch pancakes, I was surprised by how immediately I wanted in. Confession: the main convincing-moment was the suggestion to add lox as a topping. I've been craving Lox Round Two since first tasting it in February at Booeymonger's. I wanted to make these pancakes but promptly forgot about it. Then, when I found myself in Walmart picking up a package of smoked salmon, I somehow vaguely remembered that buried craving. Being off work yesterday (an independent adult walking around in public in the middle of a week-day? It feels just as divine as it sounds), I pulled out my cast-iron skillet and got to work. Somehow, between magazine and my preheated oven, the topping combination I imagined became sushi volcano rolls, dutch-pancake style. Please don't ask. Just trust. I mean, I don't even eat sushi with any frequency (I've eaten it once, and yes it was a volcano roll and yes it was homemade and yes it was absolutely thrilling). 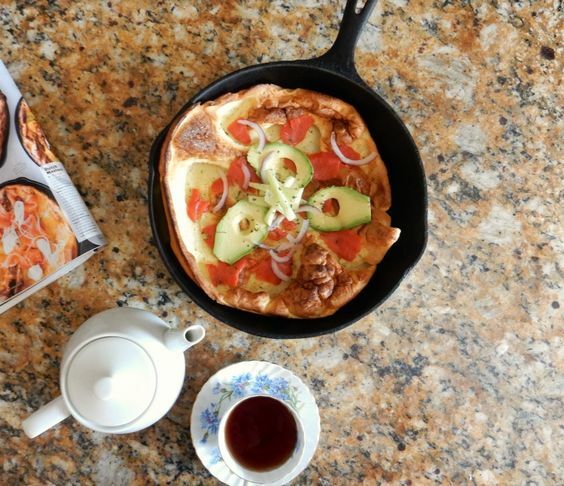 But this dutch pancake is savory. It's smoky. It's complex. And it puffs up gleefully high in the oven before falling, which is just very, very exciting to watch, in my opinion. One reason I'm so excited about this breakfast is that it comes with plenty of protein from the eggs and salmon, gives you a shot of morning vegetables from the julienned cucumber and sliced avocado, provides you with some lovely Omega 3's from the salmon, and then makes you generally feel amazing because you created something magazine-worthy with very little trouble or vexation. I think it's pretty much impossible to mess up a dutch pancake. I mean, it's supposed to flop. So that means that, darlings, you've even got Monday morning beat. 1.) Put the skillet in the center of the oven and preheat the oven to 450 degrees Fahrenheit. Keep the skillet in the oven for about 20 minutes while you prep the pancake batter. 2.) Crack eggs into blender and blend until very frothy. With motor running, gradually add in the milk and melted butter. Pulse in the flour, pepper, and salt. 3.) Remove skillet from the oven and immediately drop in the extra tablespoon of butter. It will brown quickly so have the batter at the ready and pour immediately into the skillet. 4.) Return to oven and bake 20 minutes or until pancake is puffed and golden around the edges. 5.) Remove from oven, top with the "volcano roll" toppings, or other toppings of preference, and enjoy warm with a cup of black coffee or tea. Because who wouldn't want to start off their morning this way? How funny, we just had a Dutch pancake, Mom called it a "Dutch baby." But it was sweet not savory. But I am bookmarking this under my Epicurian label. Mmmmm, looks delicious! Dutch pancakes are the best. Growing up on a farm in Holland, my grandma and her siblings always ate pancakes for breakfast, only theirs had a "speck of bacon" in the middle. They would put a really fatty, crunchy piece of bacon right in the center. My grandma used to always cook my cousin and I Dutch pancakes when we came to visit, and, as a result, I can hardly stand the fluffy American pancakes anymore. I've never commented on this blog before (though I've been following it and The Inkpen Authoress for awhile), but my Dutch pride is making me comment now, haha. Thanks for sharing such delicious-looking recipes with us!